The Giants took a couple big hits to their defensive line this week as both Robert Ayers and Mathias Kiwanuka were placed on IR with pectoral and knee injuries, respectively. The Bears placed Lance Briggs on injured reserve with a groin injury. He may have played his last snap with the team. Texans CB Johnathan Joseph exited Sunday's Week 13 game with an Achilles' injury. Brandon Meriweather was diagnosed with a sprained big toe and it looks like he could be headed to injured reserve. If this turns out to be the case, Phillip Thomas would be the next man up on the depth chart. Tyrann Mathieu will have surgery to repair his fractured/dislocated left thumb and will miss at least three weeks. The Steelers believe DE Brett Keisel tore his tricep in Sunday's Week 13 loss to the Saints. Vontae Davis is in the concussion protocol. Ryan Shazier is expected to return for Week 14 against the Bengals after missing the past 4 weeks with a knee injury. Despite a poor matchup, Robert Quinn exploded for 3 sacks against the Raiders. Kudos to the owners who stuck with him through a couple of rough games recently. LaRon Landry continues to be a part time player. I don't foresee this changing, so he's really a player to avoid until further notice. Quintin Demps seems to have been demoted permanently back to a reserve role. He can be dropped in pretty much all formats. The return of William Moore to the starting lineup pushed Kemal Ishmael back into a part-time role. He only saw 24 snaps last week. This said, it looks like the ride is coming to end with him. He's another player that can be dropped in most leagues. Telvin Smith was once again in an every down role last week and came through with another studly performance boosting his tackle count to 23 over the last two weeks. He should be one of your top waiver priorities this week if he's still available in your league. Antoine Cason's poor play seems to have caught up with him as his playing time was cut in half last week. Rookie Bené Benwikere stepped in and saw the majority of starter snaps opposite Josh Norman. Brian Cushing continues to rotate significantly. That, along with his regression on the field, has led to a big drop off in his production. He's not going to be of much use to fantasy owners this year and you may want to try and unload him in dynasty leagues as well. DE Desmond Bryant (CLE) - I recommended Bryant last week and he came through for us in a big way with a 6-1-1 stat line. He's got another very favorable matchup this week against a Colts team that has really struggled to protect the quarterback. Let's continue to ride the hot hand here with Bryant. DE Chris Long (STL) - Long returned last week after an 11 week absence (he hurt his ankle in the season opener). Understandably so, the Rams eased him back into the lineup as he played in 40 of the team's 82 snaps. The good news is he managed 2 tackles, a sack, and a fumble recovery in limited time. His snap count will increase over the final remaining weeks and with Robert Quinn and Aaron Donald playing well on the line, he should see plenty of one-on-one opportunities. With the Redskins on the schedule next, Long should make for an excellent DL3+ now and potentially for the rest of the season. DE Jared Allen (CHI) - Allen hasn't put up the numbers Bears' fans were hoping for when the team signed him to a 4 year, $32 million deal in the off-season. He has put up 3 sacks in his last 4 games, however. The Cowboys have been a middle of the road matchup this year, but I'm a big believer in big name players make big plays down the stretch and Allen fits that bill. MLB Jon Bostic (CHI) - With Lance Briggs out for the year, Bostic was the sole every down linebacker against the Lions. This led to one of his best performances of the year with 11 total tackles (7 solos). I'd expect him to stick in subpackages moving forward, making him a legitimate LB3 candidate. He'll play against the run-heavy Cowboys on Thursday, which should bode well for his tackle production. OLB Anthony Hitchens (DAL) - Many thought the Cowboys reached for Hitchens when they drafted him in the 4th round of this year's draft; however, 12 games into the year, it's looking like that may not completely be true. Although he hasn't played to the level of teammate Rolando McClain, he has played all three linebacker positions for the Cowboys this year at an adequate level. He's coming off a 12 tackle performance and with McClain struggling with conditioning issues, he could see the lion's share of tackle opportunity in the immediate short term. High variance LB3. OLB Danny Lansanah (TB) - In many respects, Lansanah is similar to the Bengals Vinny Rey. He's an average on-the-field player who puts up gaudy fantasy numbers when given an every down role with little tackle competition. In the two games Lavonte David's been out, Lansanah has put up 21 total tackles. If David misses another week, it would be a prudent idea to get Lansanah in your lineups in the majority of leagues that start 3 linebackers. OLB Whitney Mercilus (HOU) - With Brooks Reed largely absent from the box scores this year and Jadeveon Clowney shaping up to miss this week's game with a lingering knee issue, Mercilus is well set up to have a big game against Jacksonville's anemic offensive line. For those in big play leagues, he's worth serious consideration for a starting spot on your roster this week. S William Moore (ATL) - The Falcons wasted no time in getting Moore back into action as he played every snap in the team's contest against Arizona. He managed just 4 total tackles but did have a forced fumble. His numbers should improve as he shakes off the rust and should be plenty busy against the Packers this week. S Stevie Brown (NYG) - Brown entered the season as a top 20 fantasy DB, however poor play ultimately led to his benching early in the season. Now with Quintin Demps struggling, Brown appears to be back to a full-time role. He had 6 total tackles and a sack last week while playing every snap. 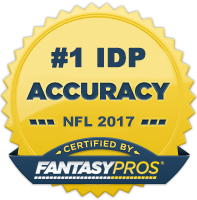 Given his historical propensity to put up big fantasy numbers, he's worth grabbing as a DB3 in deep leagues and DB4 in shallower leagues. S Tony Jefferson (ARZ) - With Tyrann Mathieu out for at least 3 weeks, Jefferson should see a nice bump in playing time (closer to what he was receiving earlier in the year). Combine that with a top 5 matchup for safeties in the Chiefs and Jefferson re-emerges as a potential DB3 this week in 12 to 14 team leagues. CB Richard Sherman/Bryon Maxwell (SEA) - Neither one of these cornerbacks has put up staggering fantasy numbers, but a matchup against the Eagles should help remedy that this week. Philadelphia has given up the most points to cornerbacks and safeties this year as their offense is set up to run a lot of plays and exploit that part of the defense. If I had to choose, Sherman would be my selection as he has the slightly higher big play upside.